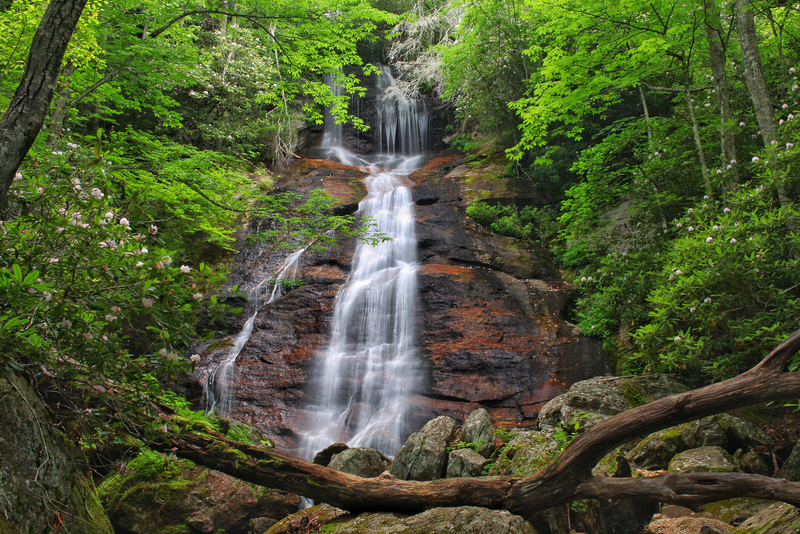 The popularity of the waterfalls along or close to NC Hwy 215 has grown tremendously over the last decade. 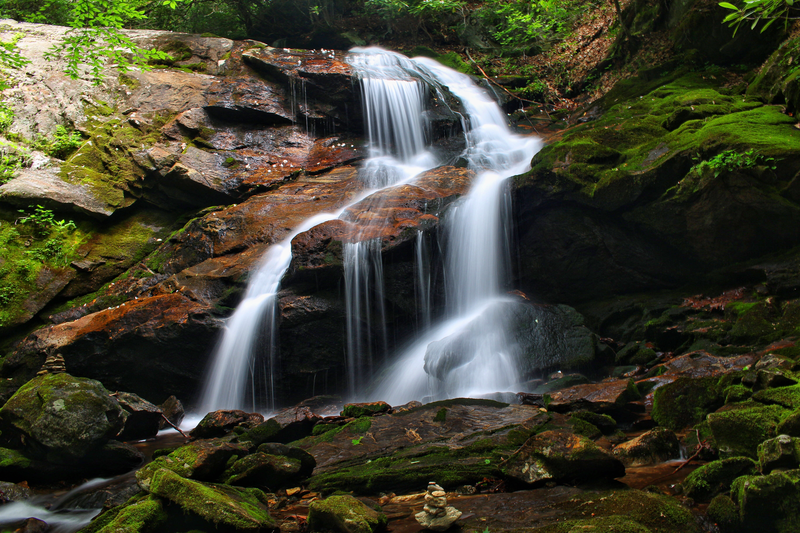 The stretch of highway 215 between US 64 near Rosman, and the intersection with the Blue Ridge Parkway is famous for the waterfalls at the Living Waters Ministries, Courthouse Falls, and the somewhat lesser known Dills. There are also a good number of waterfalls north of the Blue Ridge Parkway on or near NC 215, but this article will be all about the Dills. 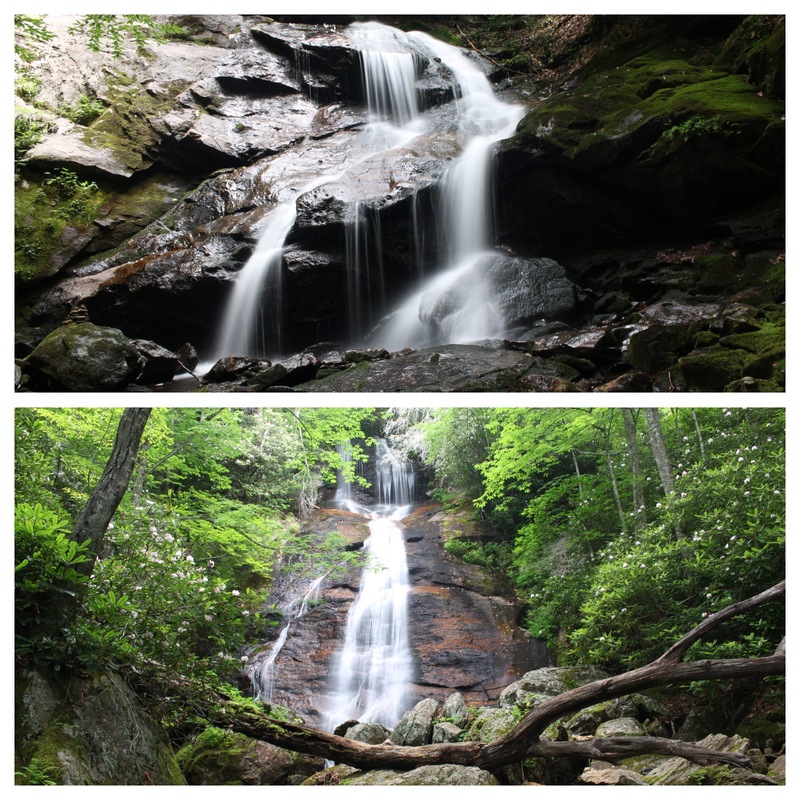 The Dills are the waterfalls closest to the Blue Ridge Parkway (between the BRP south to U.S. 64), and also the easiest to drive right past and totally miss. 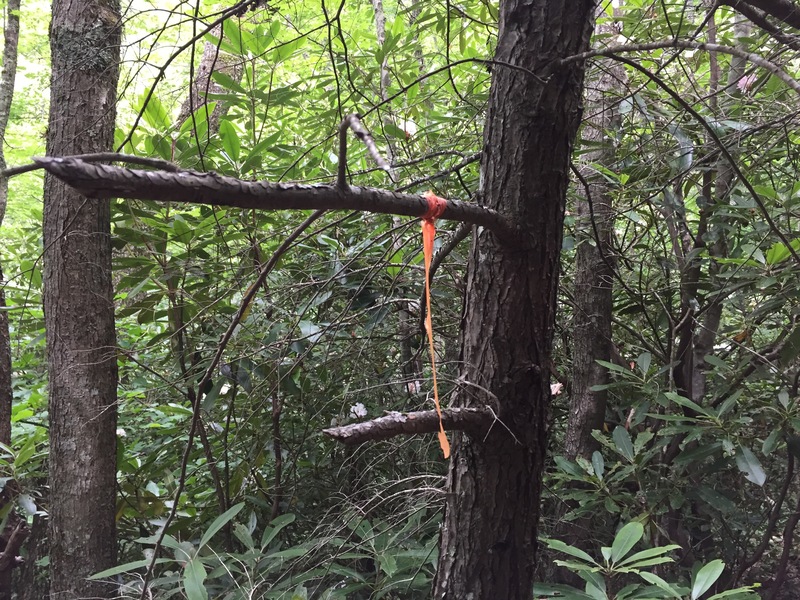 At the parking area, there are 2 trails. The first one heads right , and goes up and over a series of mounds. It reminded me of a dirt bike track, although I seriously doubt that is what it is. After the mounds, the trail keeps going up steadily and then levels off. After about a 1/4 mile, Upper Dill Falls can be seen and heard down the hill to the left. It soon comes into sight, and a short scramble path, marked by some flagging tape, takes you down to the base for an exceptional view of a very nice 25 foot waterfall on Tanasee Creek. There were a couple of rock carns placed here by prior visitors. After the short climb back up the scramble path, the trail back is a breeze. Once back at the parking area, the other trail heads straight. A large mound blocks what appears to be a continuation of the road here, but a side trail goes around the mound to continue down the old road/trail. This is the trail to the 50 ft high Dill Falls. Just like Upper Dill Falls, the hike is about 1/4 mile, at most. The hike to Dill Falls is pretty much all downhill at only a slight grade. So the return trip is nothing strenuous. At 1/4 mile down the trail, the road crosses Tanasee Creek. Look to the right, and just upstream is the beautiful Dill Falls. A short scramble and safe rock hop can get you in better position up and in the creek somewhat to explore and photograph. Some people climb the bank on the right to work their way up to Upper Dill Falls from here, including several young guys that were also here on this day at the same time I was. I would not advise it. It is steep, risky and there is a much easier way to get there just by walking up the other short trail route. If it was the only way, well that would be a different story. The lighting was a little rough for photography here as it is somewhat open here. The landscape was covered in blooming Rosebay Rhododendrons adding to the beauty of this unique waterfall. The large fallen tree has been here every visit I have made here but it’s condition has diminished some. I always kind of liked it to show scale here. After the easy return back to the parking area, total round trip mileage for both waterfalls was right at 1 mile. 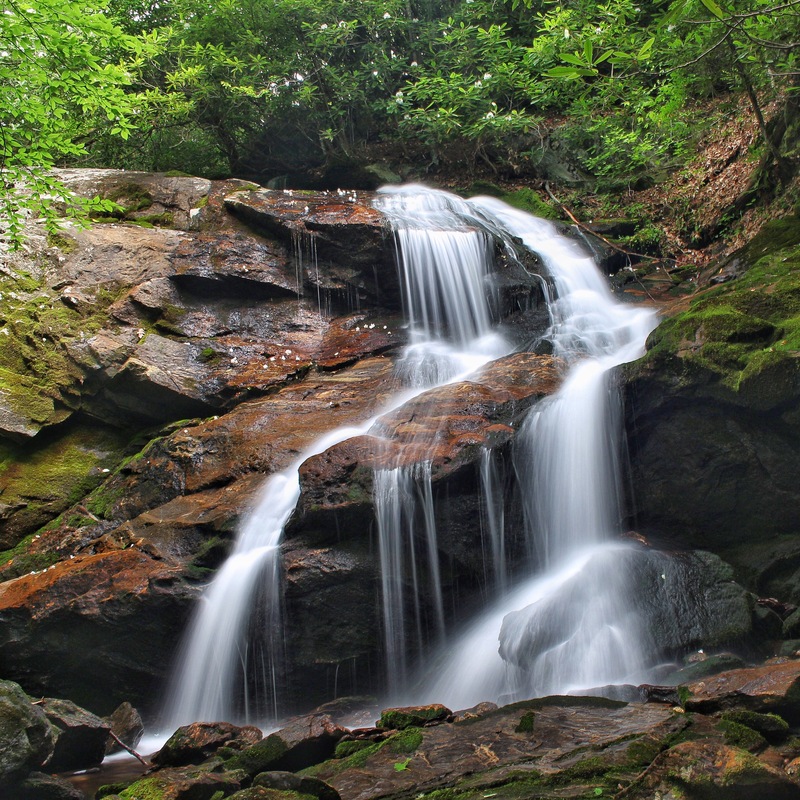 Other waterfalls close by include Courthouse Falls, French Broad Falls, Mill Shoals Falls, and Bird Rock Falls, all further down south on NC 215. If you are interested in prints or canvasses of Dill Falls or Upper Dill Falls, please check out my site http://chris-berrier.artistwebsites.com.